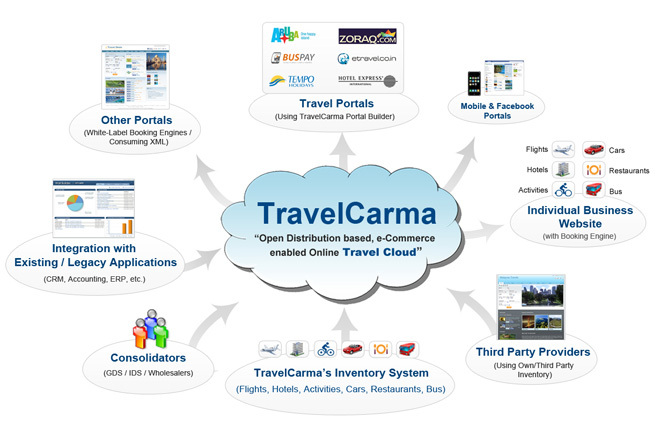 From contracting to inventory aggregation and consolidation, setting up online agents’ network, to online inventory distribution and content delivery via multiple points of sales to reservation management to accounting to content management to reporting – TravelCarma allows you to manage all your travel operations on a single travel technology platform. Our vast pool of XML integrations will help you quickly acquire your online content and Inventories from GDS, Suppliers, Channel Managers, CRS, PMS or your own legacy systems. You can sell your inventories through any online, offline or both sales channels through intuitive travel booking engines that work on all mobile and handheld devices. You can easily scale your operations by using our innovative Travel API platform that will help you distribute your content to third party software systems. This coupled with our revenue management tools, the back office accounting and supplier management solutions provide complete automation of your business process resulting in very high cost savings. Our mid-office system allows you to track all your users, manage your bookings, manage online requests and generate reports and analysis – from a central location. Our revenue management tools, back office accounting and supplier management solutions provide complete automation of your business process resulting in very high cost savings. Expand your Internet presence by appointing web affiliates or developing micro websites and put white labels of your booking engines on their websites. You can sell your inventories online and/or offline to other OTAs and Wholesalers, with your best rates through our powerful travel booking engines that work on all mobile and handheld devices. You can easily scale your operations by using our innovative Travel API platform that will help you distribute your content to third party software systems. Integrate inventories from GDSs, Wholesalers, Channel Managers, CRS, PMS or your own legacy systems - on the single platform and manage the supplier content through a user-friendly web interface. Service complex travel queries for multiple destinations within minutes and even provide multiple options for each segment and destination. The same can be provided to the customer for online viewing. Booking can be done using the same saved quotations. This solution in itself would save you and your staff an enormous amount of time.